Home › Insider › Archive by category "Weddings"
The Charles Mack Citizen Center is a beautiful and convenient location for rehearsal dinners, weddings, and/or receptions. Located in the heart of downtown Mooresville, it has a small-town feel, with big-city perks. The Citizen Center has several options for the setting of the special day and the staff works with the bride and groom to accommodate their wishes! Reservations can be made up to a year in advance. Spaces can be rented by the hour or by the day. There are two outdoor garden locations available and six indoor ballrooms. This way if you are looking to have an outdoor wedding and and indoor reception, you can have both without completely moving locations! In the ballrooms, there are customizable dance floors depending on the size of your wedding. Flexible room options are also available based on the number attending the wedding. Also available is state of the art audio and video equipment. To help make the big day run smoothly, a list of local caterers and service providers is also provided by the Citizen Center. There is also easy and convenient parking for the wedding party and guests. For a full list of rates for the different spaces, be sure to check their website. Here you can see an entire list of what is available at The Citizen Center and what the fees are. 1. Book in Advance! Weekends get booked fast, so if you are looking to host your rehearsal dinner, wedding, and/or reception here, act fast! 2. Take Advantage of the Location. With the venue being in the middle of Downtown Mooresville, be sure you use what is available to you for photos! 3. Have both your ceremony and reception at the Citizen Center! There are a total of 8 spaces(indoor and outdoor) for you to choose from, all offering something a little different. The Breezy Meadows Farm is not only a fully equipped farm with horse stables, but it is also a popular wedding venue. The owners began the farm due to their daughters love for horses. They had spent some time on farms and felt this was really where their family thrived! Today they offer a full boarding service for horses, riding lessons, and week-long camps during the summer. The boarding service offers awesome stables and includes feeding twice a day. They receive grain and hay, along with any supplements they need. Fresh water is provided in the stalls and on the pastures. The stalls are maintained and cleaned regularly (twice daily) and horses are given blankets during chilly weather. All of this is available to horse owners for only $400 a month! Lessons are private and are one hour in length. Because lessons are offered privately, they will be specialized to your needs. Whether you are a beginner, intermediate, or an advanced rider, the lessons will be on your level! In addition to riding, grooming, tacking, and untacking are included in the lessons. Lessons are $35 per hour. Summer camps are a wonderful way for kids to expand their knowledge of horses and learn different riding techniques, while also gaining life experiences and making new friends. Kids get the chance to learn how to properly care for a horse and get to show off their new skills by preparing for the horse show held every Friday afternoon. Summer camp lasts from Monday-Friday and starts at 8:30 and ends at 1:30. Be sure to check the website for the next summer schedule! If you are looking for a rustic, barn wedding, then look no further! There are indoor and outdoor spaces available for ceremonies and receptions. Breezy Meadows offers a full planning service or just the rental of the space- it’s up to the bride and groom! The farm is where southern elegance meets rustic charm. There are several different decorative items that can be used which include; chandeliers, ceiling drapes, lights, wooden wagon wheels, crates, and mason jars. Whatever theme you are interested in creating, it can be done here! 1. Visit! The Farm is beautiful and on a great piece of land. Be sure to bring an apple with you because there are always horses that would enjoy a snack! 2. Attend Camp or Take Lessons. If you or your children have an interest in horses, these are both wonderful ways to expand your knowledge and gain first-hand experience with these amazing creatures. 3. Board your Horse. If you or someone you know needs to board their horse, the Breezy Meadows Farm is a great place! Your horse will receive the best care and attention. The Arbors is a 112-acre tree farm in western Rowan County North Carolina. It is the perfect place for a wedding or corporate event to take place. There are two unique venues to choose from which are The Main House and the Pavilion. Both packages include an outdoor wedding ceremony location, followed by an indoor reception. The Main House overlooks a three acre pond that is full of fish and wildlife. The House is a custom built home with an attached 4700 square foot reception area. The reception space is heated and cooled, includes commercial restrooms, a bar, and a catering prep area. The outdoor space includes a large dock, huge outdoor living areas with a fire place, and two fire pits. With the beautiful stone, rustic beams, and cedar shakes, the main house truly has an outdoor and picturesque feel to it! The Pavilion is the brand new 4200 square foot reception facility constructed of stone and cedar shake siding. This offers guests the rustic feel of the farm with the amenities of a climate controlled banquette. The Pavilion has restrooms, a dressing room,a bar, and a place for catering prep. The Mason Dixon Collection offers a wide variety of vintage and eclectic rental items available on site. With everything from mason jars, to tabletops, to wooden church pews, to vintage sofas, the Mason Dixon Collection has everything you need to make your wedding personalized. Brides who have booked their weddings at The Arbors, receive a $100 credit towards the rental items and receive advice on how to create the perfect theme they are going for. The Arbors is a well known wedding venue and has received accolades and features by several different organizations. The magazines that have featured The Arbors include Carolina Bride, Inpire Weddings and Marriage, Ruffled, and Style Sweets Magazine. The Arbors also received the Wedding Wire Bride’s Choice Award in 2013! *To Schedule a tour of the venue or if you need additional info, call them at (704)614-5856. 1. Take a Tour! Whether you are looking for a beautiful outdoor wedding venue or a great location for a corporate event, The Arbors is a wonderful option. 2. Check out the Mason Dixon Collection. This is a fantastic way to personalize your wedding and to guarantee your special day looks exactly how you envisioned. 3. Have a Rustic Outdoor Wedding! With everything from church pews, to mason jars, to vintage sofas, your day can have a wonderfully rustic feel! The Brawley House is a historic home built in 1907. It is a Queen Anne Victorian House on almost 23 acres of landscaped land. The 5,500 square foot mansion has all original wood floors and 12ft ceilings. The house has been beautifully restored and now has wood paneling, textured interior walls, and the exterior has a fresh coat of paint. From the historic home, to the carefully landscaped surrounding land, it’s no surprise many couples choose to spend their special day at The Brawley House. The Estate not only has a beautiful historic home, but also lots of lush green land surrounding it with several different options for event spots. There is a newly constructed stable that can be used for the wedding ceremony or reception. The stable is 3,400 square feet, with tall ceilings, and can hold up to 250 people. Outside of the stable is a lovely white arbor that is a perfect spot for the ceremony nuptials to take place. The Brawley House is a great location for not only weddings and receptions, but also corporate events, birthdays, anniversaries, and any other special occasion worth celebrating! There are small ceremony packages and semi-inclusive packages. The small ceremony is for two hours and does not include a reception or food. The semi-inclusive package includes tables, chairs, linens, buffet tables, cake and gift tables. There are also wedding coordination packages available. Call (704)222-8185 for pricing, a quote, or to schedule a tour of the estate. There is a food vendor requirement, however all other vendors are up to the guests. If you are looking for suggestions on vendors for other aspects of the event, they have a list of recommended vendors available. 1. Schedule a Tour! The Brawley House and surrounding grounds are historic and have been preserved beautifully. 2. Host a Celebration. Weddings, receptions, birthdays, anniversaries and corporate parties can all be held at the estate. There are several awesome locations for events to be held, whatever the event is! Whether you are interested in a small, medium, or large size wedding ceremony, The Quarry at Carrigan Farms is a wonderful location! Because of the beautiful landscape, many describe the Farm as a piece of “Heaven on Earth”. It has the perfect blend of mountain and beach vistas, blue water, and towering granite walls as the wedding backdrop. There is also a large covered pavilion that is perfect for the reception. Flash weddings are spontaneous wedding ceremonies that are only booked a few days in advance. Carrigan Farms takes care of everything, minister, music, flowers, food, cake, etc. The months of February, March and November occasionally have unusual warm, sunny days that are typically chosen for a flash wedding. During the peak season, April-October, flash weddings are during the week, mainly Monday-Thursday. They can either be during the day (10am-3pm), or evening (5pm-11pm). The flash weddings are a great alternative to a courthouse or chapel wedding. They still feel personal and special, while not taking months to plan! Carrigan Farm is not only a special place to have a wedding, it also makes for a great spot for other celebrations! The following are just some of the most popular events held here; company picnics, swim parties, graduation parties, church picnics, birthday parties, and even Christmas parties! If the event is during a colder season, like Christmas, The Farmhouse Cellar can be rented. The Cellar has rich walnut woods and handmade brick floors and makes for a great, festive space! There is actually a real working farm that specializes in growing only the finest fruits and vegetables. Depending on the time of year you can find everything from strawberries to asparagus, lettuce, apples, and even pumpkins! Nearly all of the produce is sold on the farm and a lot is used in catered events. Carrigan prides itself on being able to provide the best and freshest produce to their guests. 1. Tour the Farm & Quarry! 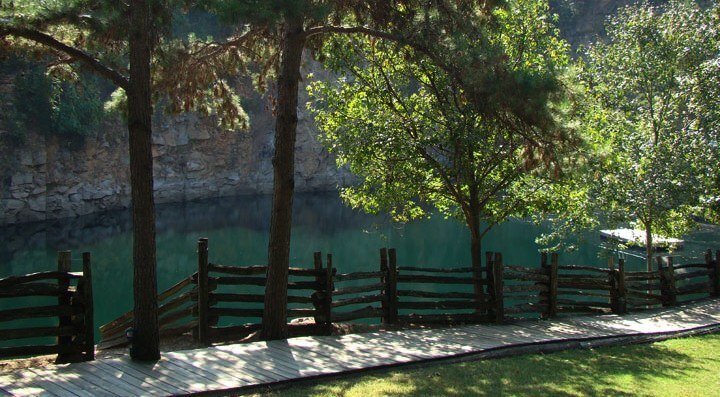 If you are interested in hosting a wedding or other special event, the Quarry at Carrigan is a breathtaking location. 2. Buy some Produce! Everything grown on the farm is extremely fresh and has had such care shown to it. Stop by the farm and see what’s available when you are in town! 3. Have a Flash Wedding. Whether you are looking for a quick and easy way to have a wedding ceremony, or you know someone who is looking to do so, the flash weddings at the Quarry are a great option. The mission of the staff at Oak Ridge is to eliminate as much stress a possible for the bride, groom, and wedding guests. They do this by only having one event per day, which allows for flexibility when setting up and tear down. Brides also have the opportunity to schedule their bridal portraits or other photography sessions on the grounds on another day at no extra charge. Oak Ridge prides itself on being an “open venue”. This means the caterer, music, photographer, etc are entirely up to the bride and groom. They do not require a certain list of vendors, however they do have a recommended list if the couple would like to choose from that! The bed and breakfast is a great place for close family and friends to stay during the wedding weekend. A relaxing breakfast is served each morning and can be enjoyed in the dining room or outside on the porch! Typically brides book rooms the night before the wedding with their maid of honor and bridesmaids. This is a good opportunity for a last hoorah with the girls before she gets married! The breakfast also serves as a nice relaxing hour for the bridal party before the wedding ceremony. If you are considering having your wedding, reception, or the rehearsal dinner at the Oak Ridge Farm, definitely come out and take a tour! To schedule an appointment to see the grounds and the historic home call them at (704)663-7085 or (704)807-2433. 1. Plan a Visit! If you are just passing through, or are looking for a wonderful outdoor venue for an event, this is a quant little place to visit! 2. Book an Event. This is a great location for weddings, receptions, and rehearsal dinners and will guarantee a good time! 3. Book some Rooms! This is a wonderful place for the bridal party and family to stay and includes an awesome breakfast the next morning.